WASHINGTON, Oct. 23 (Yonhap) — The top nuclear envoys of South Korea and the United States met in Washington to continue coordination on North Korea’s denuclearization, the South Korean side said Tuesday. 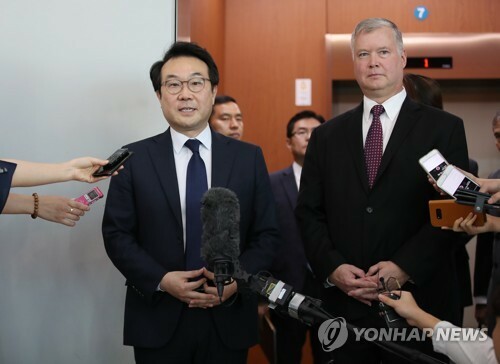 Lee Do-hoon, Seoul’s representative for Korean Peninsula peace and security affairs, held talks with U.S. Special Representative for North Korea Stephen Biegun Monday. The two mainly talked about a potential second summit between U.S. President Donald Trump and North Korean leader Kim Jong-un, ongoing negotiations between Washington and Pyongyang, and a possible road map for North Korea’s denuclearization and reciprocal steps from the U.S., Lee said in a meeting with reporters. A second Trump-Kim summit is expected to happen early next year, according to recent reports, and U.S. Secretary of State Mike Pompeo has said he hopes to meet with his North Korean counterpart next week to discuss the issue. Kim committed to work toward “complete” denuclearization of the Korean Peninsula during his first summit with Trump in Singapore in June. In return, Trump committed to provide security guarantees to the regime. The details of the deal have yet to be agreed to. Lee said he and Biegun have met 11 times since the latter took office in early September. Their latest meeting came after Lee and Biegun returned from their respective trips to China and Russia, two more key stakeholders in North Korea’s denuclearization. “We talked about how we can rally the support of China, Russia and the rest of the international community,” Lee said.